My daughter made a request yesterday for Lemon Bars, I had made them awhile back and they were such a huge hit that they were gone in one day. Only hitch was that I had no lemons, with the rain pelting down and wind howling, getting into the car and driving all the way to the store just for a few lemons wasn’t appealing to me. Luckily, there were quite a few limes congregating in the fridge. 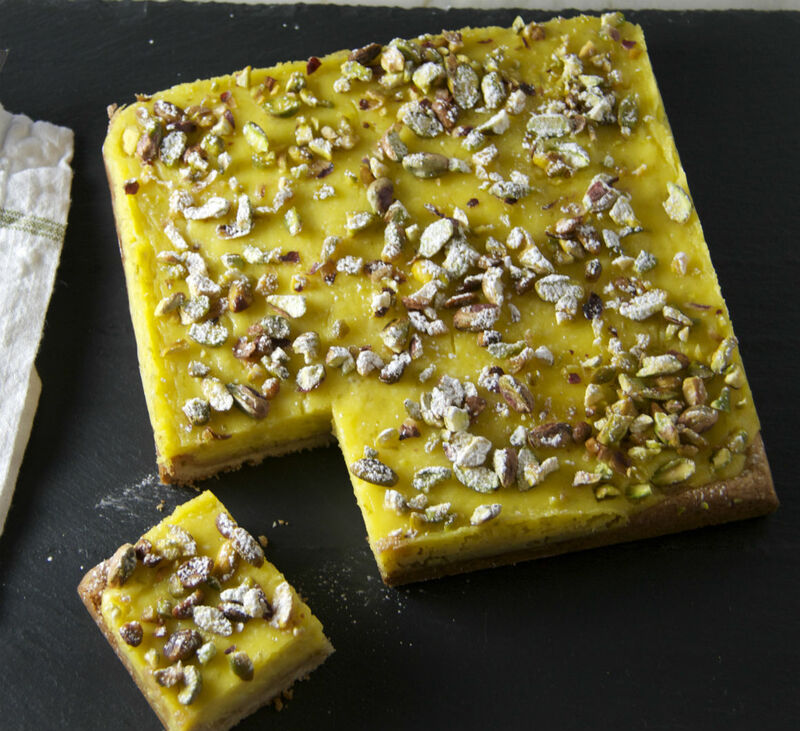 I thought what the heck, why not use the Lemon Bar recipe as a template – switch limes for lemons, and add a sprinkling of crushed pistachio’s to give them a nice little crunch as well. Who says gluten free baking is hard? Heat the oven to 350°F with a rack in the middle position. Line an 8"x8" baking dish with parchment, laying down in one direction length wise then one piece width wise. Leaving about 4 inches of extra parchment at all ends. Beat together the butter and powdered sugar in a stand mixer (or with a hand mixer) on medium-high speed until they are completely combined, resembling a creamy frosting, approx. 3-4 mins. Stop the mixer and scrape down the sides of the bowl as needed while mixing. Add the flours, and salt to the bowl. Beat on low speed just until all the flour is incorporated and the mixture comes together into a dough. The dough will seem fairly crumbly, but should hold together when squished in your hand. Press the dough into the baking dish in an even layer. Prick with a fork all over. Bake for 20 to 25 minutes, until the edges of the shortbread turn golden-brown. Now for the lime filling, whisk together the eggs, yolks, and sugar in a small (2-quart) saucepan, whisk in the lime zest, juice, and salt to form a smooth, liquidy mixture. Place the pan with the lime mixture over medium heat. Stir, gently but continuously, until the mixture thickens enough to coat the back of a spoon and registers about 155°F on an instant-read thermometer. This should take 8 to 10 minutes. Be sure to scrape the bottom and edges of the pan as you stir. If you notice the mixture starting to coagulate and clump up, immediately remove the pan from heat. Stir in the butter cubes until completely melted. When the shortbread crust is ready, remove it from the oven and pour the filling over the top and sprinkle with the nuts. Bake again 350°F until the edges of the curd are set, but the middle is still jiggly, 10 to 15 minutes. Cool completely on the counter, and then cover and refrigerate for at least 4 hours (or overnight). Remove from pan by grasping ends of parchment paper and set down on cutting board. Sprinkle with confectioners sugar then slice into squares and serve. Bars will keep refrigerated for several days.